What if that doesn’t work out? How in the world will we ever be able to do that? I wonder if she thinks I’m…. Please tell me I am not alone on this one. Please, please. Because just like a toilet spiraling downward, my mind, at times, follows a similar downward trend. And in that very moment, I realized that I do the very same thing. Oh my word, I water the weeds of my mind! But at times, I forget to do it. 1. Starve the stomach of self-pity. If you don’t feed it, it will not grow. Circumstances are not ours to control and they may not even be ours to change, but they are ours to conquer. 2. Give thanks in everything. I’m thankful that this verse uses the word “in.” Because there are things for which I struggle to be thankful. But I can be thankful in the circumstance because there is always something to be thankful for- for who God is if nothing else. 3. Pull those weeds out before they take root. When I saturate my mind in Scripture, I find that the weeds aren’t even given a chance to take root. Then they dry up and wither. Last Thursday night we had prayer meeting. Water. 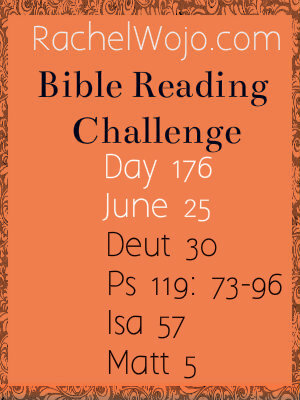 Each day I’m doing my best to keep up with the Bible Reading Challenge (just caught up!!) The Word is water. Sunday morning I heard God’s Word preached in church. Water. 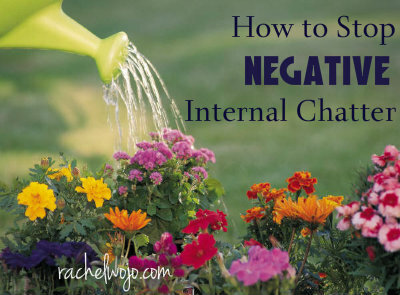 I’d love to know: How do you stop negative internal chatter? Hi Rachel! First, thank you so much for this post. I’ve been dealing with internal negative chatter for a few months, and it’s draining. Like you, I find when I’m in the Word, my mind doesn’t go to those negative places. I don’t know why I don’t start in the Word before letting my mind go to places it shouldn’t. Another idea is doing something for someone else (like your #1). When my husband was going through cancer, I knew I needed to help others, or I’d start playing the pity party game. Now, I had my share of that party during that time, but just helping someone else was a way for me to focus on them and not my circumstances. Thank you, again, for this post. It’s such a blessing! Love your point, Megan!! With my Taylor girl’s terminal disease, there are days that I can easily play the pity-party game. But like you, when serving others, I always find focus and joy. Thank you so much. I try to keep in mind to talk to myself the same way I would talk to a friend, and then to catch myself and replace the thoughts with Truth. If I need to, I do talk to myself out loud to speak the Truth. Hearing the Truth, I start to become encouraged. This post is so right on. Thank you for your words of wisdom. Great point, Joanne! Isn’t it interesting that we talk to ourselves unlike we would talk to anyone else? Thank you for this. Thank you so much for your post. It was exactly what I needed this morning! Once I start feeding my fears it’s hard to stop. I’ll take more time to feed my faith instead today. oh I love that “feed my faith.” Thank you Jane! This is a God sent message. My heart is healing due to actions that my husband did. I’m trying so hard to overcome and accept the new us, but I have dealt with tons of negative chatter. I stop and ask God is this from you or the devil trying to suffocate my soul. My friend said that I can stop now. She gave me a scripture that says we are victorious in all things. The battle is already won. So now I sing victory in Jesus when chatter starts to creep in like a weed. Amen to the battle begin won. What a great way to defeat the enemy through praise in song- that’s exactly what Paul and Silas did in prison. I love that Bible story. You know Ann, I often ask myself that same question, is this something I needed to hear or is it Satan pushing my buttons, thanks for you response you are not alone, and Rachel, I found this page by sheer accident, but I know it was God ordained. KNOWING how to fix it and DOING it are sometimes miles apart for me. Often the hardest thing to do is just to keep doing what I know I should do…when my heart isn’t in it, when I don’t “feel” the effects, when I can’t see immediate results. Even though I’ve seen it work in my life and the lives of others so many times before. Struggles and negativities will always prague a Christian’s life, and sometimes it seems so hard to just keep on…but that’s exactly what we have to do. Even when I feel dry and depleted; so dry that I wonder if the “water” can actually penetrate the roots of my being this time, I just keep on reading and praying and serving and singing. (Eph 3:13-21; Gal 6:9; Isa 40:26-31) So today, I am reminded to get up, go through the motions of doing it all over again today. Even if it doesn’t bring about change today it will eventually…and maybe that’s what God’s purpose is in the whole matter…change WITHIN me, not around me. Thanks for helping me stay focused today! Beautiful phrasing- change WITHIN me, not around me. Amen! The word helps with negative chatter it brings life and light to the situation, starves out the doubt, fear, anxiety. and brings truth, because the real battle is in the mind. So I focus on his truth and light comes on and clears a path so I am not thinking on the negative, but positive. Great post Rachel. I love this! I just read this in a book yesterday too, so I think God is speaking in a big way. I have 3 chronic illnesses and I am NOT thankful for them, but in the circumstance I can choose to be thankful for something. Being thankful when you don’t feel it is very hard, but there is always, always, always, something to be thankful for. God is so good and so faithful even in trying circumstances. Thank you for sharing this, as God has spoken and I need to pay attention!! You know, I think Lysa Terkeurst may have a quote in Unglued similar to this. I’ve said it over and over to myself so much that I’m not 100% sure where it come from. But it sure is truth! This hit me hard and I was able to as you have said shut out the negative chatter and stop watering those weeds. Thank the Lord because I was drowning in my own self pity. May our Lord bless you and your family! Thank you for sharing stories like this one. My mind never stops and often it is busy thinking of the negative which then leads to anxiety . I feel comfort knowing I’m not alone . And through your , unveiled wife , Love , Honor, and vacuum , and Women Living Well I have learned I am not alone and how to use scripture to fight these feelings off. Thank you for the time you spend on this website encouraging others. Hi Rachel, WOW! Are you somewhere near me right now? I needed this post so bad!! This morning I have just been fighting with myself…..and I wasn’t winning! haha This post hits me right between the eyes and snaps me right out of that conversation that I was having with myself! Oh how I need to journal this today!! I love how God is so right on time and so faithful. I love how He uses blogs and posts just like this right when I need it! Thank you so much for being obedient to God and for encouraging others through your website and posts! God Bless You Sister in Christ! It’s probably one of my biggest issues. My husband says I ‘think’ too much, but it goes way deeper and if I’m not careful the enemy uses my negative thoughts to keep me bound in fear, worry, you name it in the mind games dept. Thank you so much for this post…this is something I am currently working on because I know that my thoughts and actions greatly affect my family, and I want to turn them towards Jesus. But if I’m turned away, I can’t do that. I LOVE your quote, “Don’t water the weeds.” I think that might be my current-life motto! Hi! I wanted to respond to this post all day long! I finally have a chance to! First I wanted to say that I too have been surrounded by so much chaos lately and thus by negative chatter as well! Having found this blog has helped me so much to try to reduce that and I too- like you- when I realize that I am having so much negative chatter begin to pray or go to scripture! Bedtime was the worst time for me as I always let negative chatter over take my sleep. Since, I’ve started the bible study I save one reading (or a couple depending on my time) to read right before I go to sleep and this helps me so much! Especially if there’s a verse that’s my favorite I read it more than once! Another thing that has helped me reduce negative chatter is to find one positive thing that happened in my day or that happened to someone I know and I write it down in a journal I am keeping!!! And then I find a verse that relates to that experience and write it down on the opposite page! So when it’s one of those really bad days- I can go back to my journal and look back at those positive comments! Thank you for being so inspirational and sharing your knowledge! It has been so helpful and life changing!!! I have allowed my mind to be filled with weeds, negative self talk, the internal chatter, those thoughts that just never seem to disapper. It’s because I keep watering those weed with added fertilizer too boot! I have allowed these weeds to choke out the one thing that should be the most vital life giving part of me and that is my relationship with the Lord and the truth of His Word! Why is it when I am confronted with those negative thoughts that I let them take root? Why do I entertain the thoughts over and over. It is because I am not bathed in the truth of God’s Word. I am not meditating on scripture, I am not praying boldly in the throne room of grace. When did this happen I ask myself? When I left the situations and circumstances that we are currently in consume me and I began to doubt God’s goodness and soverign hand in my life. I have been angry. NO I am angry at the trial we are enduring. I am not enduring it well. I have a bad attitude, a dirty heart and a sin sickened soul. I don’t like the person I have become – resentful, bitter, complainer and very ungrateful. If I don’t like it, I can only imagine what God thinks! So today as I say to myself over and over I will try and not allow the negative chatter take hold. I will not water with lies. I appreciate this blog as it so speaks to my life where I am. It encourages me because I know that God is in control and He loves me with an everlasting love. I need to choke the weeds out with the WORD! 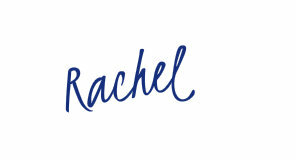 Thank you Rachel for the post! Kristi, I believe you may live in my house. We are currently engaged in a Domestic Violence ancd custody dispute involving my grandson who lives with me. His mother was also abused and this guy just can’t seem to letup with the games. We have had three trials in three months. With the bills, the constant paperwork, dealing with my daughter and everything else in my life, on Saturday night I was up quilting about three in the morning. I just lost it. Then i went to church the next morning and heard about Job and then the song in the service was Leaning On The Everlasting Arms and the Pastor’s sermon was on submission. I cried through the whole service and he said “If anyine has anything that they need to lay down and not pick back up, leave it on the altar today.” I did it, and my Pastor prayed for me and it was like it just went up to God. We had our trial the next day and I promise you, without really having the worry, knowing I had totally submitted it to God, I knew that the outcome was all in His hands. And the biggest relief from the whole thing was that I did not have the constant worrying – did I miss something, did i not tell the lawyer something, etc. I knew that even though it did not turn out exactly like we wanted, there were a lot of small victories that will be important down the road. And, I had the assurance that whatever happened, it was all part of His Perfect Plan. This is so not like me. I always had to be in control, always had everything constantly running through my mind on a constant loop. I had two Bible Study groups, SS class and others praying for me at the time and I promise it felt like a blanket. Now, the father started playing mind games less than 24 hours later and I fell back in for about 5 minutes and then the words ofnthe song came through “What have I to dread, what have I to fear” and it drained away. I also recommend looking up Psalm 44:4-8 (NASM) and replace the name Jacob with the name of whomever is needing the support in the trial. It just so happens that my grandson’s name is Jacob, and I claim that God authored that verse thousands of years ago because he knew I needed it right now. I hope this is helpful and I hope that things turn out the way you would like. But I am sure they will be part of God’s Perfect Plan. Thank you so much for addressing this issue. I have been cost much in my life through the invasiveness and persistance of negative “inner dialogue” (that’s what I’ve called it.) It has literally ruined relationships and lives. I realized that years ago, but sometimes, my mind tries to “walk that way” again. It’s very deceitful! I believe that’s what God refers to as “guile” which is a sin. Thanks again for all the pointers and for letting me know I’m not the only one. Let’s all pray for each other about this. We all want to be godly wives, mothers and friends. bless you, Joy! Thanks for your input. Excellent point to pray on this topic! !